"An American writer goes to a remote Welsh manor on a $20,000 bet: can he write a classic novel like Wuthering Heights in twenty-four hours? Upon his arrival, however, the writer discovers that the manor, thought empty, actually has several, rather odd, inhabitants." 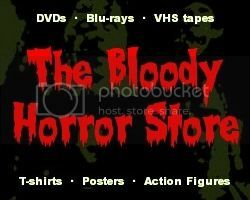 For some reason when I was a lot younger, I always confused "House of the Long Shadows" with the abomination known as "Bloodbath at the House of Death". It probably had something to do with Vincent Price being in both of them, although I'd also guess that the stupid titles were somewhat interchangeable in my own mind. Either way, I'd only seen a third of the the latter before switching it off and had never watched the former. No matter how many times it cropped up on late night television, I'd vowed to never watch that crap again and changed the channel immediately. Having recently discovered "House of the Long Shadows" on YouTube, I clicked on it to see if it was as horrible as I remembered. It was only then that I realised that it wasn't actually the film I hated at all. 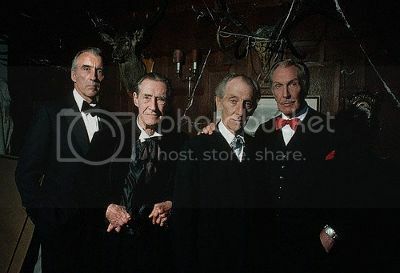 Starring the four most famous veteran horror actors of my youth, Vincent Price, Christopher Lee, Peter Cushing and John Carradine (okay, that's really only three because I never much cared for John Carradine in anything), "House of the Long Shadows" was exploitation movie director Pete Walker's finale. I'm not sure exactly what happened, but he never made anything else afterwards. I'm going to keep this as brief as I can because I'm still somewhat undecided about whether or not I really liked "House of the Long Shadows". I did find it entertaining and enjoyed the series of twists at the end. More than that, I cannot say, but hopefully, I'll come to some conclusion by the end of this review. Being pretty sure that I had only ever seen Desi Arnaz Jr. in the "Automan" TV series before watching this, I really have no idea if he was ever a serious actor or just a comedian. Therein lies a problem since the film spent a lot more time focused on his character than the horror actors. Everything about his persona was rubbing me up the wrong way in a kind of "poor man's David Naughton" manner at the beginning, but he grew on me by the end. As soon as I saw Julie Peasgood, my heart really started to sink because I've never liked her or her incongruously fake posh accent which, to this very day, she still forces over the top of her real Northern one. She used to be Fran on "Brookside" (a Liverpool based soap opera on Channel Four), and I couldn't stand the sight of her on that either. I know it's an irrational thing, but some actors and actresses just do that to me. Mercifully, her appearances were brief and to the point in this film. The "old guys" were either as serious or as camp as they ever were and had enough screen time to be more than just cameos. The only thing I didn't really like was Peter Cushing's rhotacism. It was embarrassing and a shame to ruin his perfect speaking voice. Vincent Price was mostly his usual self but somehow slightly more serious due to his age. He was a pleasure to watch but certainly wasn't as commanding as Christopher Lee. Let's face it, nobody could be as commanding as Christopher Lee, and he stole every scene he was in. As for John Carradine. Who? He didn't do much and I can't remember ever seeing him in a good movie, or at least, in a role where he played anything other than himself, a grizzled old man, or a cowboy. There were a few other actors who all did well with what they were given. Although Sheila Keith was largely wasted, she looked horrible enough. Richard Todd did a great job at the beginning and the end. Norman Rossington was a suitably surly railway station master, and the married English couple of Richard Hunter and Louise English surprised me with their reappearance later in the film. I wanted to see a lot more of Louise English really but not quite in the way things turned out for her character. The horror elements were quite good, but to be frank, this was all very dated and slightly comical stuff. Having read some things about the film since watching it, it seems that it was intended to be a comedy originally, but then it was decided to edit it back into a straighter horror. I see nothing wrong with that, and I wish it would happen to a few more "horror-comedies", but it's painfully obvious where one thing was intended and another delivered. I was most amused by an obligatory "cat scare" which happened twice but only showed the black cat once. There was a "meta" moment of explanation concerning this, but following the big reveal at the end, the whole story turned out to be a giant old school prank anyway and three years before "April Fool's Day" did it all again. "House of the Long Shadows" had no big scares, but one of the "gore scenes" disturbed me slightly because I know of at least one person on the planet whose real life story made that a lot more horrible to me than it really was. I'm not going to say anymore about that though because I'd hate for the Google search robots to pick up on it. I don't mind getting some second-hand internet fame from crappy old horror movies, but I don't want my blog to ever be associated with real crimes. I suppose, if I liked films such as "Clue" (1985), I might have appreciated "House of the Long Shadows" more. I'm not a fan of very much outside of the horror genre though, so I was probably expecting too much from it. It was still a horror movie but with a much lighter feel than the ones I really like, so I'll just rate it as average.